​Acid Neutralizers: are made with translucent media tanks to allow you to view the media level in the tank. We incorporate a dome fill hole to allow easy refilling of media. 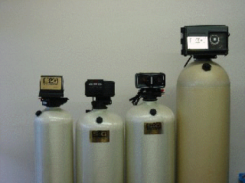 Iron Filters: can use several types of media depending on your water conditions. Some are catalysts, others can be regenerated with an oxidant. Taste& Odor Filters: can be designed to address the contaminant causing the problem. We have a variety of materials available to reduce or eliminate any taste or odor. UV light radiation penetrates the outer membrane of bacteria and viruses allowing the DNA (the cell's bearer of genetic information) to be destroyed. A minimum of 10,000 micro-watt/seconds are needed to destroy the most common organisms. We can provide systems for any flow rate from 7 GPM to 60 GPM in our residential line up to 1,260 GPM single units for industrial applications. The most important requirement for UV systems is to prefilter the water prior to the UV unit. If you don't, any foreign matter in the water supply can coat the UV chamber components preventing the UV light from properly operate. Feed pumps can be used to treat pH, bacteria, hydrogen sulfide, carbon dioxide, and other contaminants. Remember that when injecting a solution to treat a contaminant, you must also have a holding or contact tank(s) to allow time for the chemical to react. We have pumps that operate with your well pump, by metered pulse, and non-electric proportional feeders.